Ravichandran Ashwin-led Kings Xi Punjab will take to the field against Mumbai Indians at the IS Bindra Stadium in Mohali. 19.35 IST: FOUR! Full length delivery outside off, Miller smashes it through covers. It is wide of the fielders at deep and they have no chance to stop that. Only 6 needed off the last 2 overs. 18.33 IST: SIX! Once again Gayle hits back-to-back maximums! This is better than the last one. Full and on off, Gayle clears his front leg and tonks it over the bowler’s head. The straight boundaries are short so it carries all the way. The big man has released all the pressure that was building. 50 up for the hosts. It has not come up in quick time but they have not lost a wicket. 18.08 IST: SIX! That is colossal! A cracking sound of the bat on that one! Short and on middle, Gayle picks the length early and deposits it into the mid-wicket stands. 17.56 IST: We are back for the chase. Out walk Punjab’s dominating opening pair of Chris Gayle and KL Rahul. Mitchell McClenaghan to start the proceedings with the new ball for Mumbai. 17.37 IST: SIX! Another full toss and this is hit into the stands by Hardik. Now we know why he refused a single on the first ball. A high one and Pandya flicks it over the mid-wicket stand. 17.30 IST: OUT! Hardus Viljoen removes Krunal Pandya for 10. Probably not as Krunal falls after hitting two boundaries! The short ball does the trick. He looks to pull but does not get on top of the bounce. It takes the top edge and goes uppishly towards square leg. Murugan Ashwin runs in and takes a good catch. Second for Viljoen and Mumbai seem to be losing their way here. 17.28 IST: FOUR! What was the fielder doing there? The short ball is pulled through square leg. There are two fielders one from the left and the other from the right go for it. The one from the left has a better chance to stop it but for some reason, he lets it through. Boundary to begin the over, ideal start. 17.13 IST: FOUR! Edgy but Mumbai will take it! Short and outside off, it turns back. Pandya looks to cut but gets an outside edge through third man for a boundary. 16.51 IST: FOUR! 100 up for the visitors. Exquisite! Full on off, Yuvraj drives it straight down the ground through mid off for a boundary. 16.45 IST: SIX! Don’t even bother looking, this one is out of here. Length delivery on middle and leg, de Kock rocks onto his back foot and pulls it over the mid-wicket fence for a maximum. First six of the game and a big one. 16.35 IST: FOUR! Deft! Lovely shot. Second boundary for him like this. Once again waits for it and then stays leg side of the delivery. Guides it past short third man and the ball races away. 1000 Indian Premier League runs for de Kock. 16:30 IST: OUT! Murugan strikes in his very first over. Quicker and straighter on middle, Suryakumar Yadav looks to play it across but misses it completely. It hits him on his front pad, Murugan goes up in appeal and the umpire raises the dreaded finger. 16:23 OUT! It is the skipper Rohit Sharma, who has been dismissed! 50-1 for MI. A much-needed wicket for Punjab and it is a big one as Rohit was looking so good. Viljoen draws first blood! He bends his back on this one and bowls it full on middle, Rohit plants his front foot across and looks to flick but misses to get hit on the pads. 16:17 IST: After four overs, Mumbai Indians are 35/0. 16:15 IST: Mumbai Indians are off to a good start, they are 28/0 after three overs. 16:11 IST: A nicely worked boundary by De Kock as he slams Ashwin’s bowl. 16:01 IST: First over gone, The ‘Hitman’ ends it with a boundary. 7 without loss for Mumbai Indians. 16:00 IST: What do you reckon, guys? 15:57 IST: the players are on the pitch. 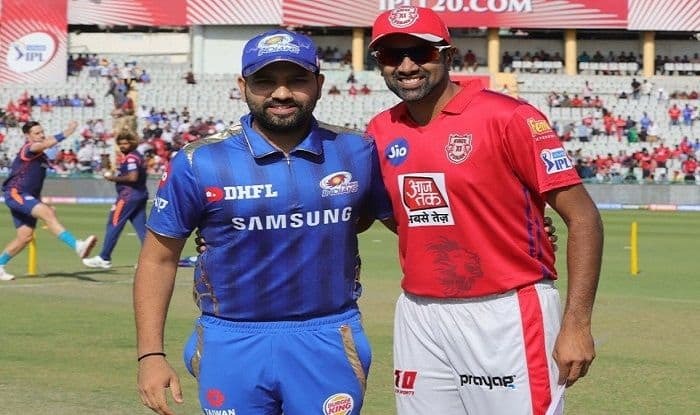 Quinton de Kock and Rohit Sharma to open proceedings with the bat for Mumbai Indians and the ‘mankader’ Ashwin to bowl first for the hosts. 15:47 IST: Following are the conformed XI of both sides. 15:37 IST: Just the one change for hosts Kings XI Punjab – Murugan Ashwin comes in for Varun Chakravarthy. 15:36 IST: No changes for the Mumbai Indians, they have retained the same starting eleven. 15:32 IST: Ravichandran Ashwin has won the toss, his KXIP side will look to bowl first. 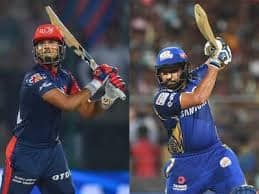 15:20 IST: It is the visitors who have the edge in this fixture – Mumbai Indians have won against Kings XI Punjab the last four times this tie has been hosted by Mohali. 15:15 IST: The toss will take place soon, stay tuned. 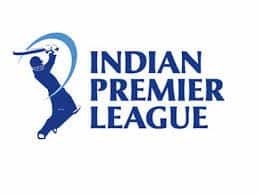 Brief Preview: With the ‘Mankading’ shadow still hovering over them, a deflated Kings XI Punjab will look to get their house in order when they take on Mumbai Indians in their first Indian Premier League (IPL) home game this season at the IS Bindra Stadium in Mohali on Saturday. After beating Rajasthan Royals on the road in their opening fixture, a game infamous for Ashwin’s ‘Mankading’ Jos Buttler, Kings XI lost by 28 runs to Kolkata Knight Riders at the Eden Gardens. Ashwin went for a lot of runs after he asked the home team to bat first, and looked out of sorts on the field too, making a silly mistake of allowing the team to have only three fielders inside the circle when Mohammed Shami castled Andre Russell towards the end of the first innings. It was called a no ball. Russell went on to smash a 17-ball 48 as KKR scored 56 runs off 19 balls since the incident. Kings XI lost the match there and while chasing, were never in the game. On Thursday, MCC clarified that Ashwin seemingly “paused too long” which was “not within the spirit of cricket”. This was a U-turn from their previous stance where the custodians of the sport said the 32-year old did not violate the ethics. 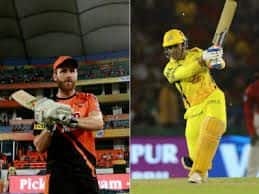 Punjab can draw heart from David Miller and Mayank Agarwal scoring hhalf-centuriesin the last game, with Shami bowling really fast and exceedingly well.